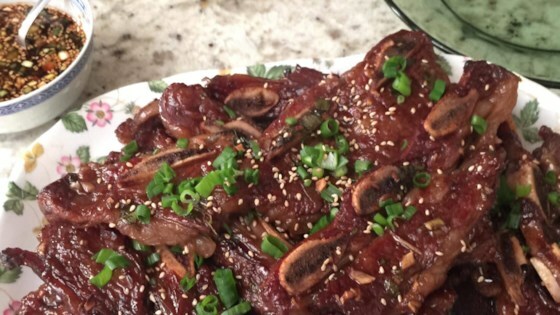 "This is a easy way to make Korean BBQ. You can also substitute chicken breast or sliced rib-eye for the short ribs. If you use chicken or rib-eye, you must add thinly sliced green onion tops. This can also be broiled in the oven for the same amount of time." Pour soy sauce, water, and vinegar into a large, non-metallic bowl. Whisk in brown sugar, white sugar, pepper, sesame oil, garlic, and onion until the sugars have dissolved. Submerge the ribs in this marinade, and cover with plastic wrap. Refrigerate 7 to 12 hours; the longer, the better. Remove ribs from the marinade, shake off excess, and discard the marinade. Cook on preheated grill until the meat is no longer pink, 5 to 7 minutes per side. Slow cooked in crock pot - fabulous!! !